We know that prayer should be like breathing - just a normal part of our daily lives. Yet, like the first disciples who asked Jesus how to pray, we need help and so do our youth. 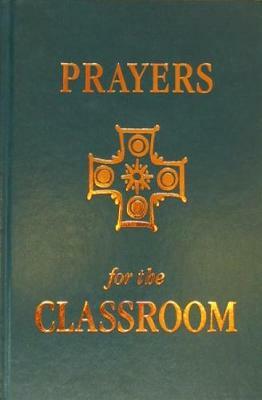 Prayers for the Classroom provides that help with structured daily communal prayers, particularly for private school teachers who want to begin class with a prayer. In keeping with the seasons, these community prayers enrich the liturgical spirit of every part of the academic year. Prayers for the Classroom incorporates the needs of the group and the social and individual character of each participant, and helps youth learn how to pray with others as well as on their own. These prayers are universal, tried and tested, touching hearts in a personal way. Celebrating diverse cultural origins, Prayers for the Classroom draws on a variety of sources, including expressions of East and West, women and men, youth and sages, biblical and non-biblical beliefs. A simple resource that encourages consistent use, Prayers for the Classroom can be used as a daily program or as an occasional prayer resource; the collection is arranged and indexed by themes so that it can be used easily either way. The format is easy to follow: it is divided into the months of the school year from September through June, with each month divided into four weeks with five distinctive prayers for each week. Each prayer includes a short introduction and background and follows the general pattern of the liturgical season. In November, Thanksgiving prayers are presented; December includes several prayers relating to the Christmas theme; in February and March, lenten prayers are provided; April contains resurrection themes; and May has Pentecostal prayers. In addition to furthering the celebration of the liturgical seasons, this collection captures the poetic and mystical spirit of spring and fall. The variety of these selections allows teachers or students to choose a prayer at random depending upon the desired theme. Chapters are Introduction," "Suggested Use of This Book," "September Prayers," "October Prayers," "November Prayers," "December Prayers," "January Prayers," "February Prayers," "March Prayers," "April Prayers," and "May Prayers." A thematic index is also included. Verhalen prepared Prayers for the Classroom to stimulate the minds and hearts of users to a greater union with God, a union that leads to the spontaneous prayer that comes from the depths of the inner-self; prayer that will become, like breathing, a natural part of our daily lives. Its hard cover and one ribbon marker facilitate its use in communal prayer. Philip A. Verhalen, PhD, is adjunct professor of religion at Pacific Lutheran University and a religion teacher at Bellarmine Preparatory School in Tacoma, Washington. He has published Faith in a Secularized World and several articles on religion and theology.